SEBRING, Fla. - After a long day's journey into night, Corvette Racing scored its sixth GT1 class victory in seven years in America's classic endurance race, the Mobil 1 Twelve Hours of Sebring. Johnny O'Connell, Jan Magnussen and Ron Fellows drove their No. 3 Compuware Corvette C6.R to an eight-lap victory over their teammates Oliver Gavin, Olivier Beretta and Max Papis in the No. 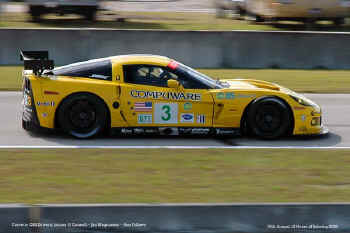 4 Compuware Corvette C6.R. O'Connell became the all-time leader in Sebring victories with his seventh career win on the historic circuit. His victory tonight broke a longstanding tie with motorsports legend Phil Hill, who tallied six victories on the Sebring course. Johnny O'Connell: All-Time Leader in Sebring Victories "It's huge to break Phil Hill's record," said O'Connell. "Phil is the embodiment of everything that was wonderful about that era of sports car racing. When you meet some of your childhood heroes, they're a disappointment, but when I met Phil, he was the coolest cat in the world. He talked about the beauty of the cars he competed in and the spectacle of this race. When you spend time with someone who is that deep and insightful, you come away with a much better understanding of how special this race is. "When you win Sebring, you share it," O'Connell noted. "It's not about one guy. I got my first ALMS win with Jan in 1999, and I've won some 25 races with Ron. I can't think of two finer gentlemen and race car drivers I'd rather share this win with." "I came out of Turn 9 and it went completely loose," said Beretta. "I thought the race was gone. I was worried that wheels would lock and couldn't bring the car back to the pits. I didn't want to get stuck on the course." "We lost the inner tripod joint on the right side," explained team manager Gary Pratt. "All of the lube was still there, but it snapped one of the three drives at the spline. We've never seen a failure like that before." Tonight's victory was the third Sebring win for Fellows and O'Connell as teammates. The pair won previously with Gavin in 2002, with Franck Freon in 2003, and with Papis in 2004. "Today's race was unfortunate for the No. 4 car, but we ran well all day with the No. 3," said Fellows. "Crew chief Dan Binks and the guys had flawless pit stops. Johnny and Jan did a great job, and I couldn't be happier than to win Sebring with these guys." "Just like Le Mans last year, we just kept plugging away," Fellows continued. "It's a tough, tough track. It's hard on equipment and physically demanding. I think all three of us feel we have some unfinished business at Le Mans. That's the next big prize we're going to shoot for." "I'm so happy for everyone in the team, and I'm especially happy for Johnny to get the record," said the Danish ace. "Seven wins is amazing. The No. 3 Corvette performed beautifully all day long, there were zero problems. We were fast in the beginning, stayed out ahead, and toward the end we made sure we were consistent and didn't make any mistakes. I can't wait for the rest of the season!" "I think it would have been a very close race, but unfortunately these things happen," said Gavin. "We've never had a halfshaft fail, but that's racing and that's what Sebring does. We had two good wins at Sebring, but this time it got away from us. It's good to get a race under our belts, and our new crew chief Mike West did a great job all weekend. Now we're looking forward to a good season." Papis agreed: "We had a great car after the halfshaft was fixed. It ran like a Swiss watch - well, maybe an Italian watch, it was fast. Unfortunately we lost those laps early, but it's a great testament to the team that they never give up. We were pushing hard to see how the brakes would do, to see what the fuel mileage would be. I'm really glad that we got all the right answers. I'm super excited about Le Mans." Corvette Racing�s next event is the Acura Sports Car Challenge of St. Petersburg on the temporary street circuit in St. Petersburg, Fla., on April 5. ABC will televise the one-hour, 55-minute event live starting at 1:30 p.m. ET.